Canon is an industry leader in professional and consumer imaging equipment and information systems. Canon's extensive product line enables businesses and consumers worldwide to capture, store and distribute visual information. 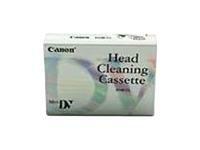 The DVM-CL digital video head-cleaning cassette cleans the video head of you camcorder for better picture quality.